In the 1920s and 1930s Rio Grande Valley land speculators, such as John H. Shary, promoted "The Magic Valley" in midwestern states as a place where citrus and vegetables could be grown all year 'round. They even had private trains which would bring prospective land buyers from all over the midwest to the Valley where they were given tours of the citrus groves and truck farms which by this time were doing big business. It was perhaps through this promoting that Frederick Norman Hagedorn left Michigan and traveled to Edinburg, Texas to try his hand in the citrus industry. Mr. Hagedorn had been a successful businessman but the Great Depression of 1929 had destroyed his creamery business in Trenton, Michigan. The idea of a fresh start in "The Magic Valley" of South Texas piqued his interest and he packed up and headed south. After unsuccessfully trying to establish himself as a citrus farmer, Hagedorn returned to what he knew best and opened the Golden Jersey Creamery in Edinburg on January 1, 1931. Harriette Hagedorn was the daughter of F. N. Hagedorn, born in 1917. She became very involed in her church and served many years at St. Joseph's Catholic Church in the school lunch program. People still talk today about her hamburgers! Alfred "Al" Martin, from Tyler, Texas joined the US Army Air Corps after graduating from Texas A & I in Kingsville, TX and moving to Edinburg in 1940. While home on leave he was walking down the street in downtown Edinburg and saw Harriette Hagedorn carrying a bag of money on her way to the bank to make a deposit. He told his buddies that this was the girl he would marry. They scoffed at him and told him that she was a "Hagedorn" and therefore way out of his league! None the less, Al and Harriette were married in April 1940. Al returned to his duties as a quatermaster in the Army Air Corps and retired as a Captain in 1945. The Martins moved to Beeville, Texas where Al managed a ranch. Soon they moved to La Feria, TX where Al became very involved in civic affairs while working at the Mercedes State Bank. He was influential in the start up of the Mercedes Livestock Show and served as one of its early superintendents. 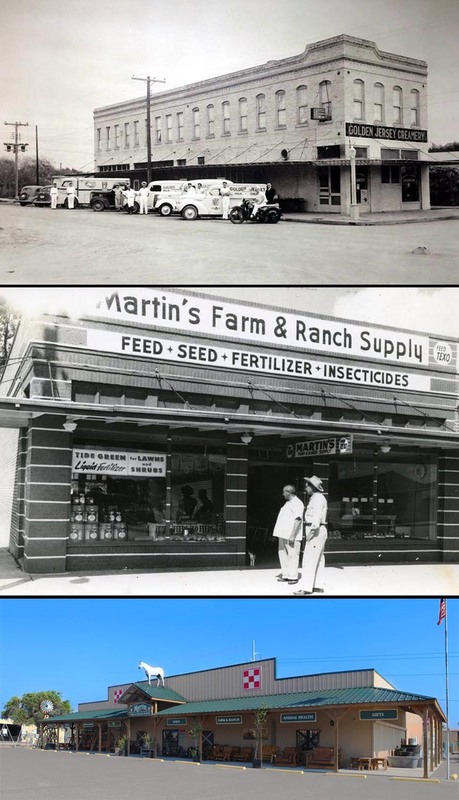 They later moved back to Edinburg where in 1955 the Martins purchhased an existing store on East Harriman Dr. (now University Dr.) and started selling TEXO Feeds. After a couple years his dreams came true, when Al bought an old lumber yard and moved his store to 614 E. Harriman. Al and Harriette had nine children, seven sons and two daughters. As parents they instilled hard work ethics and insisted that all of their children pursue higher education. In this they succeeded. All of their nine children went on to graduate from college. Eight of the nine Martin children attended UT Pan American where Al served on the Board of Regents for what was then known as Pan American College (PAC) from 1960-1965. The Martins successfully operated the Martin Farm and Ranch Store at its location on Harriman Dr. until 1977 when Al's banker encouraged him to build in a new store on Monte Cristo Rd. and Hwy. 281 where it is located today. The new store was state-of-the-art with 2400 sq. ft. of retail area and a 5000 sq. ft. warehouse. After Al's death in 2007, his son Doug Martin decided to expand and remodel the business. Doug recalls that he had always worked at the store and became a paid employee during his sophmore year in highschool in 1966. Today, the business is spread out over 6 acres of land and encompasses 10,000 sq. ft. of retail area along with a new feed warehouse and hay barns. Selling animal feeds is still the core of the business, followed closely by livestock fencing. Along with animal health products, the store has added: lawn & garden items, gift items, rustic furniture and even camo-clothing.